Celebrating ENLACE’s 25th year means celebrating the Power of With. That is, what is most significant about this milestone for us is that for 25 years we have had the privilege of walking WITH churches as THEY walk WITH their communities to bring about profound change. While ENLACE encourages and equips churches, providing technical support and some project funding during the seven to 10 years in which we walk alongside them, all of us at ENLACE know that the church and community leaders are the ones who, despite facing incredible challenges and daily struggles, live and breathe sacrificial service. As a result, thousands of impoverished people are experiencing better, safer, and healthier lives of economic and spiritual stability. 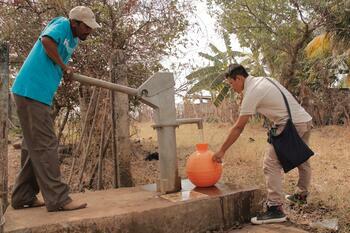 For audited reports, stories and photos of what’s actually happening on the ground, click here. The ultimate goal of our work is to empower local leaders to demonstrate God’s love by addressing eight core community development outcomes. Outcome #1 is Develop Leader Churches. In this Leading Change series, we are diving deep into the story of one such Leader Church in El Salvador in order to get a better understanding of how true transformation actually happens. The Aposento Alto Church is located in southwest El Salvador in a village called El Cocalito. This region is well known for its natural resources, beauty and rich history that reaches back to the remarkable civilizations of the Maya and the Nahua-speaking Pipil. Today, however, whether living in the mountainous areas surrounded by breathtaking views or along the coast near the warm, shimmering Atlantic Ocean, the poverty experienced by over half of the population is extreme. An average family struggles to live on between $1 and $2 per person per day. They often walk far distances to collect firewood for cooking which is done on open cookfires in the home, causing respiratory and heart problems mainly to women and children. They retrieve water from streams, where they also bathe and wash their clothes. The water is rarely clean and due to a lack of waste management, water can even be deadly, especially to children under five years old. Generally, families lack adequate living conditions, school and community infrastructure, good jobs or viable economic opportunities. Even so, they work extremely hard farming one to two acres of rented land, trying to produce enough corn and beans to get them through the year. Most hold additional jobs, such as day-laborers and factory and domestic workers. Those who can afford a stall at the local outdoor market run small-scale businesses, such as butchers, bakers, and clothing sellers. 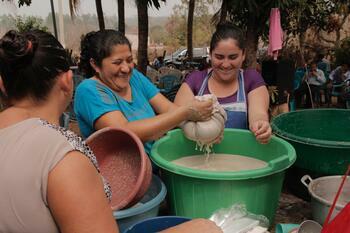 And many engage in home-based micro-enterprises, like tortilla and “paleta” (ice cream) vendors. Known for their industrious mindset, Salvadoran women, men and children sell their goods door-to-door, in village byways and squares, and along busy and dangerous highways. Women have made an art form of walking gracefully with great, heavy “huacales” perched on their heads. And incredibly ingenuitive homemade vending carts that (mostly) men have built and navigate through steep, muddy terrain and on potholed roads would impress MIT engineers. Over the years, ENLACE’s work in this region has grown significantly due to the incredible vision and heart of small, local churches. These churches are often made up of less than 100 members who, like their neighbors, struggle to make ends meet. 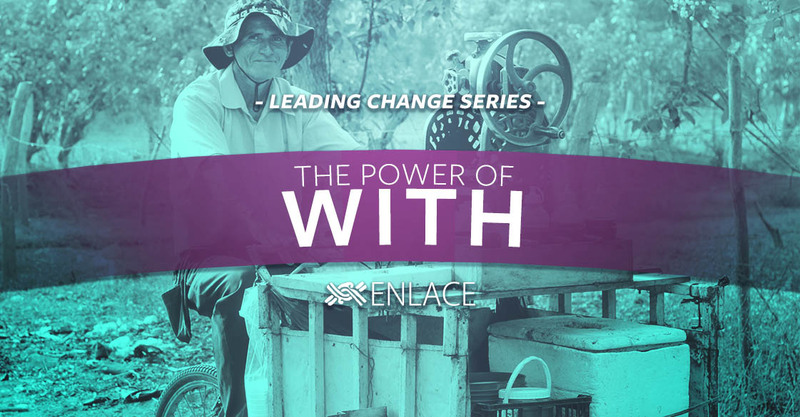 Despite their own lack of financial resources, however, churches have decided to step beyond their four walls and partner with ENLACE hoping to transform their communities. In many cases, the results have been nothing short of spectacular. In 2013 the Aposento Alto Church was comprised of 61 members who were very withdrawn from their neighbors. For this church, like many churches in El Salvador, a long history of marginalization and a theology of retreat had instilled a practice of community disengagement. But with the coming of a new pastor, Jose Israel Pineda, and his spouse, Yuleima, who had witnessed churches breaking out from this mode, that practice began to change. Within just a few years of partnering with ENLACE, this humble congregation became a powerhouse of transformation. After listening to their neighbors, taking surveys and talking with organizations already present in its community, the church started to break out of its shell. The challenges they faced became opportunities to serve their neighbors. The church began with one small road project that directly benefited 375 people. Over the next four years, the church expanded its work to serve 1557 people with composting latrines, new homes, a water system, new public school classrooms and bathrooms, and improved access to electricity. ENLACE staff, Noé Landaverde (Technical Advisor) and Dr. Evelyn Carolina Berdugo (Health Program Coordinator), helped to guide church and community leaders with each project design and implementation process, thereby fostering new skills and capacity building with every step. Every year, as the projects became more technical and required stronger leadership skills and collaboration with the community, ENLACE Church & Community Coach Williams Rodríguez Argueta, walked with the church as they developed and strengthened relationships to Cocalito’s water board, health committee, public school and mayor’s office as well as with the community associations of Cocalito and the nearby hamlet of La Joya. With these new/stronger connections, the church led fundraising efforts that resulted in harnessing local resources that matched 50% of every project’s cost. Five years ago, this small church had a strong call and desire to love and serve its community but lacked some of the method, tools and support to make the journey. But as of 2018, the Aposento Alto Church is on the road to becoming a Leader Church. The church has increased its capacity to serve its community by 300% and grown in both members and leaders by 40%. Amazingly, however, this is not the most incredible part of the story. In our next blog, find out how the Aposento Alto Church, made up of 107 members living on between $1 - $2 dollars a day, became leaders of an incredible home-building initiative that not only included new homes but a new road and zero outside resources. Subscribe to our blog with the form below to read the next episode in our Leading Change Series! Support this and other incredible stories of transformation.